Last week billions of people worldwide watched the most anticipated event of the decade, the royal wedding of Prince William and Princess Kate. One of the much awaited segments of the wedding is Princess Kate's wedding dress. Most people especially the brides-to-be looking for wedding dresses were very curious at the design and style of Princess Kate's wedding dress as well as on the identity of her wedding dress designer.Well, the long wait is over. Guess what? Replicas of Princess Kate's wedding dress are now being sold in China. 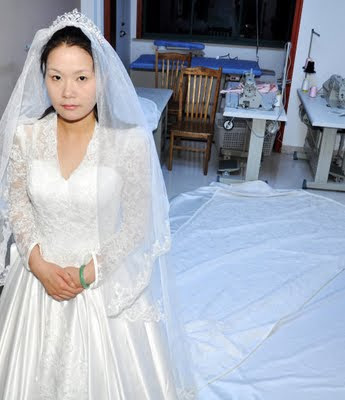 A wedding dress studio in Suzhou City, China already made replicas of Kate's wedding dress which according to report, it took 6 workers and 31 hours to complete the 3 meter long copy of Princess Kate's wedding gown. You can buy the replica of Princess Kate's wedding dress in China's largest online shopping bazaar at $280.